Church History - One Week at A Time: More than "Mere Learned Labour"
Did you know that the Bible used to contain an Epistle to the Laodiceans? Take a look at Colossians 4:16. "After this letter has been read to you, see that it is also read in the church of the Laodiceans and that you in turn read the letter from Laodicea." So.. why doesn't it appear in our canon of scripture? Well, it used to. 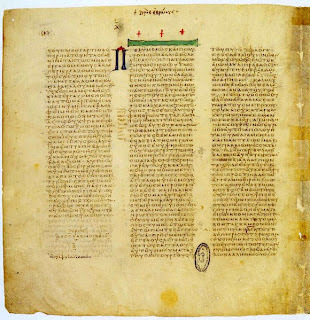 Up until the 15th century the epistle appeared in a number of manuscripts (hand written documents) including the oldest known copy, which is in Latin, as part of the Fulda MS created for Victor of Capua in 546. And therein lies the problem. Most scholars are of the opinion that unless we can find an older copy written in the original Greek, there is reason to doubt it's authenticity. You can read an annotated version of the epistle here. This has been one of many standards used to authenticate manuscripts over the centuries. It is one of the reasons many epistles were not included in scripture. The main reason the epistle appeared in so many early Bibles, including all 18 German Bibles that preceded Martin Luther's, was because of the reference to it in Colossians, even though it failed one of the standards. But in the early 15th century another longer epistle was discovered that also claimed to be from the Apostle Paul. It is a highly questionable version, only popular with New Age style cult groups and a few Kabbalah types but it was enough to add to the controversy over the other epistle. (If you care to you can read it here.) So in 1443, after the Council in Florence, the See of Rome issued, for the first time, a categorical opinion of the canon of scripture, listing 27 New Testament books, including 14 Pauline epistles ending with the book of Hebrews. The Epistle to the Laodiceans had been left out, and has been ever since. This is the reason why the search for early Christian manuscripts continues even today. Every piece of evidence adds to our knowledge of the scriptures and aids in the process of clarifying the meaning of some of the more cryptic passages of scripture. I'd like to tell you the story of the discovery of one such document. It would turn out to be one of the most important finds in the history of how we got our Bible. Constantin Tischendorf, a Bible scholar of the mid 19th century, was offended by scholars who denied the inspiration of the Bible. He was adamant in his belief that "the history of the early Church, as well as that of the sacred text, contains abundant arguments in reply to those who deny the credibility of the Gospel witness." And so he began what would become his life's work, the search for old manuscripts so he could produce an edition of the Bible as close to the original text as possible. Operating on a shoestring budget, he set out in early 1844 and searched throughout Egypt, Sinai, Palestine, and the Middle East. Many in his circle failed to understand what drove the young man to undertake such a quest. He once wrote, "To some, all this may seem mere learned labor: but permit me to add that the science touches on life in two important respects; to mention only two--to clear up in this way the history of the sacred text, and to recover if possible the genuine apostolic text which is the foundation of our faith--these cannot be matters of small importance. The whole of Christendom is, in fact, deeply interested in these results." That May found Constantin at the monastery of St. Catherine on Mt. Sinai. While there he saw a large basket filled with tattered parchments, which, it appeared were being used as fire starters, or at least being burned as rubbish. Constantin poked through the basket and was astounded by what he found there - 129 pages of the Old Testament in Greek! This would prove to be the oldest Biblical manuscript he had ever discovered -- dating from the 4th century! Now it should be mentioned that many scholars find it hard to believe that a monastery preserving over 3,000 manuscripts, many for over a thousand years, would be so careless as to burn such important documents, and so called into question Tischendorf's account. However, it should also be noted that this same monastery allowed over 1100 other manuscripts to lie buried for 200 years under a collapsed building. Not a great testimony to the monks' concern or care of the treasures entrusted to them! However the actual discovery was made, Constantin was allowed to keep 43 of the leaves which he took with him for others to examine. When he returned in 1853 it would seem that his previous visit had caused the monks to re-examine their manuscript protocols - they were no longer as forthcoming. He returned again in 1859 to much the same reception, but on the last day of his visit, a sympathetic steward showed him a rather bulky volume which contained not only the rest of the 129 leaves from his original visit, but a complete New Testament, including the Epistle of Barnabas and a part of what is called "the Pastor of Hermas." This time Constantin managed to conceal the excitement that filled his heart and asked, in on off-handed manner, for permission to examine the manuscript in his sleeping quarters. There he spent much of the night copying out the Epistle of Barnabas. It was the only complete copy ever discovered. A few days later he managed to convince the monks to let him take the volume to Cairo where he and his associates managed to copy an astounding 110,000 lines of text in just a few days. The manuscript never did make it back to the monastery at Sinai. The monks, in good faith, agreed to let the codex (denotes a book of parchment pages as opposed to a scroll) be taken to Russia to be replicated. They even forwarded a few additional pages that were discovered at a later date, never suspecting that Tischendorf would renege on his promise to return it and instead present it to the Tsar as a gift. When the monastery asked for it back, the Russians delayed and were evasive until the monks finally agreed to sell them the ancient text. When Russia fell to the Communists in 1917 they had little interest in Biblical manuscripts. They realized though that others would pay good money for what had become known as the Codex Sinaiticus, so they sold it to the British Museum for £100,000. Constantin Tischendorf, whose discovery of the Codex Sinaiticus, and other old manuscripts invaluable for checking the accuracy of current translations was born in Langenfeld, in what is now Germany, on January 18th, 1815 - 193 years ago this week. 2. Christian History Institute. Glimpses # 55 "Treasure in a Trash Pile." January 14, 1892: Lutheran pastor and political activist Martin Niemoller, who was imprisoned by Hitler for his leadership role in the Confessing Church, is born. January 15, 1697: Massachusetts citizens observe a day of fasting and repentance for the Salem witch trials of 1692, in which 19 suspected witches were hanged and more than 150 imprisoned. The day was declared "That so all of God's people may offer up fervent supplications unto him, that all iniquity may be put away, which hath stirred God's holy jealousy against this land; that he would show us what we know not, and help us, wherein we have done amiss, to do so no more." January 17, 356 (traditional date): Antony of Egypt, regarded as the founder of Christian monasticism, dies at age 105. Committed to a life of solitude and absolute poverty, he took two companions with him into the desert when he knew his death was near. They were ordered to bury him without a marker so that his body would never become an object of reverence. January 19, 1563: The Heidelberg Catechism, soon accepted by nearly all European Reformed churches, is first published in Germany. This catechism, consisting of 129 questions and their answers, also formed the basis for many other catechisms including the Westminister Larger catechism. January 20, 1918: Following the Bolshevik Revolution, all church property in Russia is confiscated and all religious instruction in schools abolished.